If you take a look at a recent chart of the Australian dollar, there’s no question that the currency is in the process of forming a top. Over the last 2 weeks, AUD/USD gradually descended from a high of 0.7750 to below 0.75 cents. 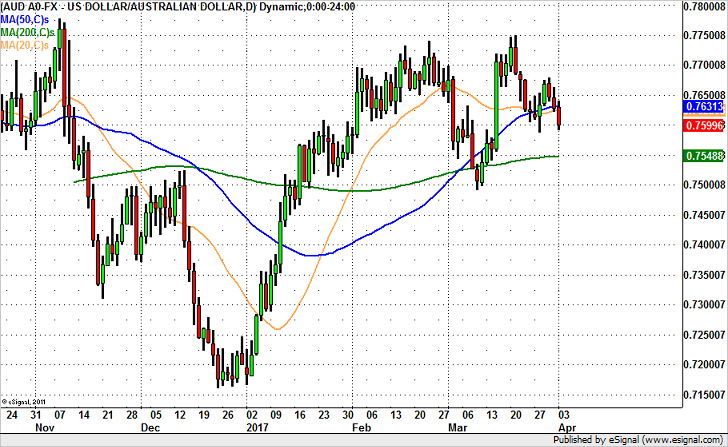 78 cents has been rock solid resistance for the Australian dollar since early 2016 and the currency pair continues to reject that level. Yet the decline in AUD/USD has been slow and AUD bears have been reluctant to call the recent move a top because of the Reserve Bank’s optimism. The Australian economy began showing pockets of weakness before the RBA met last month and while the central bank expressed continued concern about the complications of a strong currency, investors latched onto their brighter outlook for the global economy. But as the weeks passed, it is getting harder for the Reserve Bank to put on a brave face with economic data continuing to weaken. Last night, retail sales took an unexpected dip while manufacturing activity grew at a slower pace. We’ve compiled a table to show the extent of the changes in Australia’s economy since their last meeting in March and there’s been more deterioration than improvement. The RBA expressed specific concerns about the labor market and unfortunately the latest numbers provide greater cause for concern than optimism with the unemployment rate rising to its highest level in more than a year. The case can be made for less hawkishness from the RBA and that’s what we believe AUD/USD traders are waiting for, as it would imply that further easing is still on the table. If we are right and the RBA is less optimistic, AUD/USD could extend its losses to 75 cents. Technically , AUD/USD resistance is at 0.7650 with support at the 200-day SMA at 0.7550.